The story of the Whitlock Family Massacre has a sad and tragic ending. Much has already been written of this horrendous event, but little mention has been made of the Union County, SC Fowler family involved. I will go back in time to the beginning, to the circumstances that led to the demise of an entire family. Henry Ellis Fowler 1746-1808 was the father of Godfrey Fowler, who was the father of a son, Milligan Fowler, born 1804. Milligan Fowler was an investor in railroads and a prosperous planter who owned 1500 acres in Jonesville, SC. He was also a life long bachelor. Milligan had an out of wedlock son with Frances Haile b. 1795, daughter of John Haile 1734-1807 and wife Ruth Mitchell 1746-1840. This son was Felix Cornelious Haile, born in 1829 in Union County, SC. John Haile and Ruth had a son named John Haile 1781-1826 who married Rachel. The younger John Haile and wife Rachel had son Isaac Sampson Haile 1818-1892. Isaac Sampson Haile married Sarah Ann Garner 1826-1906 in Union County, SC in the mid 1840s. Back for a moment to Henry Ellis Fowler…… John Fowler “the Hatter” d. 1832 was more than likely the son of Henry Ellis Fowler. This assumption has not yet been proven by DNA testing but paper trails seem to indicate truth in the statement. Milligan Fowler was a witness to the Last Will and Testament of John Fowler, Hatter. John Fowler, Hatter was the father of Delila Fowler 1793-before 1832 who married William Whitlock 1789-1867. Delila and William had several children before her early death . The oldest of these children was son Frances Marion Whitlock 1824-1870. In 1850, Isaac Sampson Haile lived in Union County, SC with his wife Sarah, and their two children. In 1850, Francis Marion Whitlock and Felix Haile lived in nearby Chester County, SC in the household with 27 year old G.W.D. Chalk. (George Washington David Chalk 1823-1855). All three men were mechanics. Far away, and seemingly unrelated, in Van Buren, Arkansas, nine year old Pruda Bolt lived with her widowed father William Bolt (1819-1882). In 1853, Isaac Sampson Haile, his wife anc two children, packed up and headed west to the great state of Texas. Alexander “Bud” Haile, the third child of Issac Sampson Haile and Sarah was born in 1856 in Texas. A tribe of peaceful Tonkawa Indians occupied central Texas. They were a band of hunter-gatherers and made no trouble for the first white German pioneers led by John O. Meusebach who settled in 1847 into what would later be known as Llano County, Texas. Fierce tribes of Comanche Indians had moved into the region during the 18th century. Once the area became inhabited with white settlers, the Comanches began raids upon the families, stealing horses and cattle; taking as many possessions as they could carry away on horseback. Llano County, Texas was established in 1856. The town of Llano was little more than a frontier trading center. Unfortunate for the Isaac Sampson Haile family, they chose to settle in the very remote area of Texas near the Fort Mason Crossing on the Colorado River in soon to be named Llano County. This was right in the middle of Comanche tribe territory. Isaac Sampson Haile was a cabinet maker by trade. The scarcely populated landscape offered him little opportunity to use his cabinet making skills and he turned to farming and raising stock to provide for his growing family. Felix Haile had an out of wedlock daughter, Clementine Haile, with his cousin Lucinda Fowler in 1861 in Union County, SC.. I do not know if this responsibility was the reason he made the decision to move west, but both he and his cousin Francis Marion Whitlock had moved to Llano County, Texas in time to be counted in the 1860 census with the Isaac Sampson Haile family. The Isaac Sampson Haile family was one of only 217 households in Llano County, Texas in 1860. The entire county population was only 1001 souls. There were 89 farms, one of which belonged to Isaac Haile. In 1860, Isaac lived with his wife Sarah, their four children, Felix Haile and Francis Marion Whitlock, the latter two men listed as stock raisers on the census record. In 1860, in Llano County, Texas, there was a young couple also newly arrived. Pruda Bolt from Van Buren, Arkansas was now a married woman. Her husband was W.W. Garner (possibly William Walter Garner) and he was a stock raiser in Llano County. W.W. Garner and Pruda had a son, Thomas Samuel Garner born in Texas in 1864. W.W. Garner died or deserted his family before 1867. Pruda Bolt Garner had married Felix Haile by this year, and their first child was born in 1868 in Texas. There is no census record for the Felix Haile family in 1870, but they must have remained in Texas until after January 1873 when their son Creed Haile was born. The next son, John Gary Haile was born in South Carolina in 1877, and more children followed after their return to Carolina. The August 1870 census for the Colorado River community in Llano County, Texas did include the Isaac Sampson Haile family. There were several children in the household, and of special note, there was daughter Cede Haile, twelve years old. I have studied several accounts of the events that took place on December 7, 1870. I have noticed that there are slight variations in each of the reports. Mrs. W. J. Faris, 78, of Llano, vividly recalls the massacre of the Whitlock family in Llano County in 1870, the major Indian crime of early days in that section. She was a neighbor of the Whitlock family when a girl. “I spent the Saturday night before the family was killed at the Whitlock home,” Mrs. Faris says. “We often went there and spent two or three days. Mr. Whitlock was plowing near the house when the Indians came and we suppose they killed him first. They set fire to the house and Mrs. Whitlock’s body was found in the ruins, but it never was known whether the Indians killed her or she burned to death. One baby was found in the yard. It looked as though they had pitched her out of the door because her head struck a rock and killed her. “The other baby was found at the barn where the Indians had killed her with a stone. A 6-year-old girl was carried half a mile away and killed with a lance, the weapon being left in her body. The fourth child, a boy, was in the field with his father and the Indians carried him away. He never was returned, but I heard he was in Arizona a few years ago. About midnight, she says, the men who had been at the Whitlock’s reached her home, expecting to find another massacre. Hunting parties went out from Llano in pursuit of the Indians, but, although the Whitlock home was on the main road between Llano and Burnet, the redskins escaped unharmed. with the Whitlock boy. The Indians were believed to be the same band that killed a colored girl in a cotton field in the Yett settlement near Marble Falls the previous day, then crossed the Colorado river and killed a colored man, she says. From there they went to the Whitlock home on the east side of Long Mountain. Mrs. Faris is the daughter of the late Isaac Sampson Haile, who settled in the Long Mountain community in 1853. The Whitlocks came to the Llano county with Haile from South Carolina. Her father ranched in Mason county and Mrs. Faris recalls that in his frequent absences driving cattle, her brother sat on the split-rail fence and watched for Indians while she milked. Long Mountain was once a settled region to the northeast of Hoover’s Valley in far western Burnet County. It was never a well known settlement, only having a small schoolhouse. However, in early December 1870, the community’s name would become well known throughout all of Burnet and Llano Counties as well as all of Central Texas. At the time, the region on the north side of the Colorado River (present day northern Kingsland) was often referred to as No Man’s Land. Though there had been a military presence in the area since the late 1840s, tribes of Comanche Indians would often make raids upon the settlements on the south side of the river. Though these raids rarely resulted in the loss of life, numerous herds of cattle would be stolen and then taken across the river. Having lost several cows because of these raids, a resident of Hoover’s Valley decided that he would make a one man ambush against the Comanches as soon as they were crossing the Colorado near the Fort Crogan to Fort Mason military trail. His ambush would have harsh consequences. Late one night, the rancher waited with his loaded musket near the crossing. When the Comanches began to wade onto the shoreline, he quickly took a shot at them. His volley killed one of the leading members of the tribe, who some have claimed was likely the chief, and not wasting anytime; the rancher fled the crossing and made it safely back to his homestead where he was finally able to get a good night’s sleep, feeling somewhat accomplished in his mission. Early the next morning, residents awoke to see a towering pillar of black smoke rising high into the air. Upon investigation, they made a gruesome discovery. The source of the smoke cloud were the charred remains of the Marion Whitlock home, recently just having been set afire. Around the home, the farmers of Long Mountain uncovered the scalped body of Marion Whitlock, the lanced through corpse of his seven year old daughter, the remains of the family’s infant whose skull had been bashed against a tree, the family’s second youngest boy with arrows inside his little body, and inside the cabin they found the smoldered bones of Mrs. Whitlock who had been burned alive inside the house. It later became known that only one member of the Whitlock family had survived, a young boy, but he had been kidnapped and taken across the river. Feeling responsible for the sudden attack, the rancher who had ambushed the Comanches as they were crossing the river the night before, gathered the remains of the family and paid to have them buried at the cemetery at Hoover’s Valley in a common grave where they rest today. Patrols of soldiers and Rangers were sent out to track down the kidnapped child, as well as the captors, but nothing ever resulted from their searchs. The Long Mountain Massacre of 1870 is still a well known tale today of the Llano and Burnet areas of Central Texas. It shows just how rough, deadly, and savage life was in the days of the Old West and Indian Wars. Isaac Sampson Haile laid to rest the Francis Marion Whitlock family in a mass grave in Hoover’s Valley near their homestead. William Whitlock, four years of age when captured by the Comanches, was never ransomed and lived his entire life with the tribe. Isaac and his family remained in Texas although it appears that they relocated from the 400 acre farm in Llano County into Burnet County shortly after the massacre. There are ample property tax records proving ownership of Haile land in both counties. After the death of Isaac Sampson Haile in 1892, Mrs. Sarah Haile continued paying the tax debt and lived her remaining years in Burnet County, Texas. Sarah Ann Garner Haile was severely burned in 1906 when her clothing caught fire. She lived 20 days before succumbing to her injuries on January 23, 1906 in Hoover’s Valley, Burnet County, Texas. She was 79 years old. Felix Haile’s father, Milligan Fowler, died in Union County, SC in 1871. Milligan was buried on his land, the first grave in what would later be called the Haile/Webber Cemetery. Felix returned to South Carolina and inherited the bulk of his father’s estate. It is a little confusing as to the exact date of his arrival into Union County. His son Creed Haile was born in Texas in January of 1873. His second out of wedlock child with his cousin Lucinda Fowler was born circa 1873 in Union County, SC; this time a son, William Jackson Haile. Felix Haile died in 1884 and was laid to rest near his father in the family cemetery. Pruda Bolt Garner Haile died in 1891 and was buried next to Felix. The graveyard is the final resting place of many of the Milligan Fowler descendants through his son Felix Haile. Often in my research, things seem to come full circle. As an ending to this piece, I would like to add that Pruda Bolt’s son, Thomas Samuel Garner, married Alpha Ethel Fowler 1868-1929. Alpha was the daughter of Walter Gaines Fowler 1828-1870, son of Mark Fowler 1780-1853, son of Henry Ellis Fowler 1746-1808. 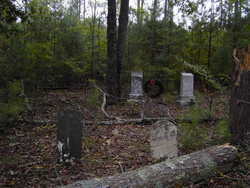 Thomas Samuel Garner and Alpha Fowler had ten children, five whom lived to adulthood, and five who died as infants and were buried in the Milligan Fowler family graveyard, now known as the Haile/Webber Cemetery.